Mobility offers significant advantages – including convenience and productivity – that benefit both organizations and their users. It also carries considerable risk – particularly as a growing number of employees have access to corporate email and networks via their personal mobile devices. This webcast will give you the insight you need to strengthen authentication from your mobile apps without inconveniencing your users – or IT. If you are responsible for the security of your organization’s systems and information, you know how important security is to your business – from compliance to customer confidence. Tune in here to stay current – and focused – on the trends, resources, and latest developments in security. Our presenters – including leading security industry experts, thought-leaders, and industry analysts – will help you discover how to apply this information to improve your security posture and transform risk into trust for your business and your users. 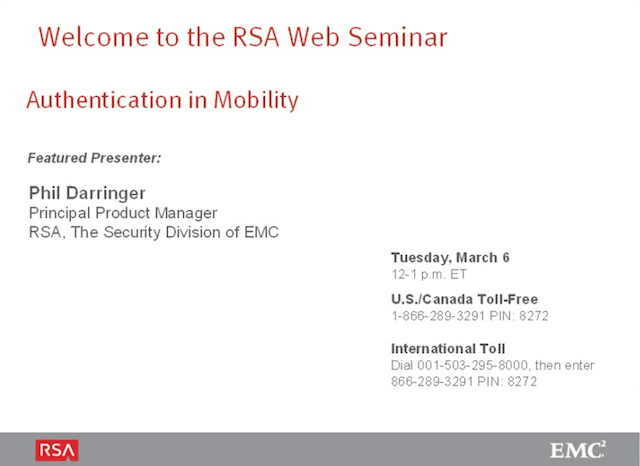 This channel is sponsored by RSA, The Security Division of EMC, the premier provider of security, risk, and compliance solutions for business acceleration.